A few weeks ago - June 3 to be exact, my best friends and I happened to be at BF Homes, Parañaque because I had something to do there and they were really supportive and came with me. :) So, after that little adventure, we decided to celebrate and Spoon Eat + Drink was the perfect spot! 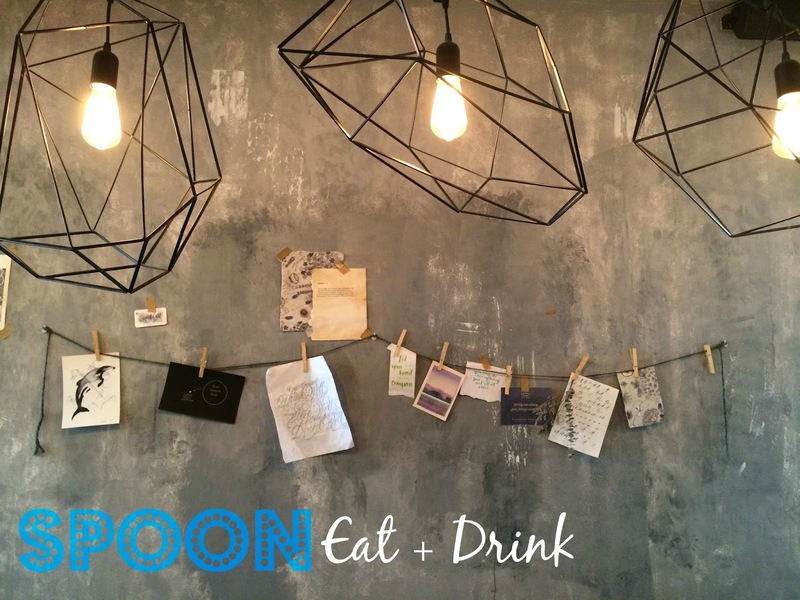 Spoon Eat + Drink is located exactly at Unit 1A, 319 Aguirre Avenue, BF Homes, Parañaque City. If you're familiar with the Pure Gold grocery and McDonald's in the area, it's near there. :) They open at 4PM to 12Midnight, so if you're nocturnal, you can hangout here! Upon ordering, they gave us complimentary popcorn, which was awesome! We had something to munch on while waiting for our food! So, what did we order? We got the Chicken PeriPeri (Php 280) that came in six sticks, Quinoa Tabbouleh Salad (Php 150) and Iced Latte (Php 90). Now, I can honestly say that the food was not bad at all. It was pretty good and if you're just looking on snacking, this is perfect. Though I wish the Quinoa Salad came in a tad bigger size. I felt sad that it was so small for Php 150. :( But, I'm only sad cos it was gooood! They have a tagline ~ "Good feelings all around" and truly, that's what the place gave us. :) We were in good company, lovely ambiance and good food! Just a warning, the place is closed on Mondays so better not schedule a visit on that day! wow. the place looks awesome! thanks for sharing, Ava!